We have all been there, a group of people in one car about to embark on a long trip. It is moments like those in which shouting “shotgun!” becomes incredbily important. Why? Not just because you avoid sitting in the back seat with your flatulant friend Bob, but because who ever is shotgun gets to also be the “DJ” for the entire trip. A blessing for the shotgun rider but a possible curse for everyone else in the damn car. Well, Pioneer has found a way to end the “road trip DJ” argument for good with their new “MIXTRAX” technology. MIXTRAX searches a user’s music library and finds tracks that are similar in genre and BPM (beats per minute) and creates “TRAX” that keep the party going non-stop without having to manually scan through your music libaray or radio stations. It even adds DJ style transitions between songs like reverb, scratching, crossfading and more to make sure that the music is a continuous experience. That stuff is all great but I am just happy that MIXTRAX can save me from listening to nothing but “Air Supply” for an entire road trip, everyone knows that “WHAM!” is where its at! MIAMI – (December 8, 2011) – Pioneer Electronics (USA) Inc. continues to innovate entertainment and audio technologies and today introduces MIXTRAX™, a proprietary technology which creates a nonstop mix of an entire music library to create a club-like atmosphere. Designed for music lovers and the club-going audience, MIXTRAX takes the music from an iPhone/iPod or USB/SD device and plays it back with added transitions and effects creating a virtual DJ inside select Pioneer products. Derived from Pioneer’s experience in developing world-renowned professional DJ products, MIXTRAX is implemented in a variety of worldwide Pioneer car audio products and STEEZ products designed for the dance community. Pioneer’s MIXTRAX technology transforms a consumer’s music library into customizable tracks that can be processed by select Pioneer products. Using Pioneer’s free MIXTRAX music management software, the user’s entire music collection is analyzed and various musical attributes including tempo and beats per minute (BPM) are identified. The software then tags each song and creates an assortment of playlists categorized in different genres and musical styles such as Beat, Chill, and Thump. The advanced analysis of the software identifies the best transition points of each song in the music library and seamlessly mixes and blends the tracks together, much like a DJ performing live. Additionally, the Mix Style can be selected between Active, Standard and Simple, adjusting the intensity of the effects and transitions used, and the duration of each track within the mix. The custom MIXTRAX playlists can be transferred to a USB/SD memory device (not included) and played through an assortment of Pioneer in-car Audio Video products (see model list below) and STEEZ products, as well as transferred directly into STEEZ products for playback. 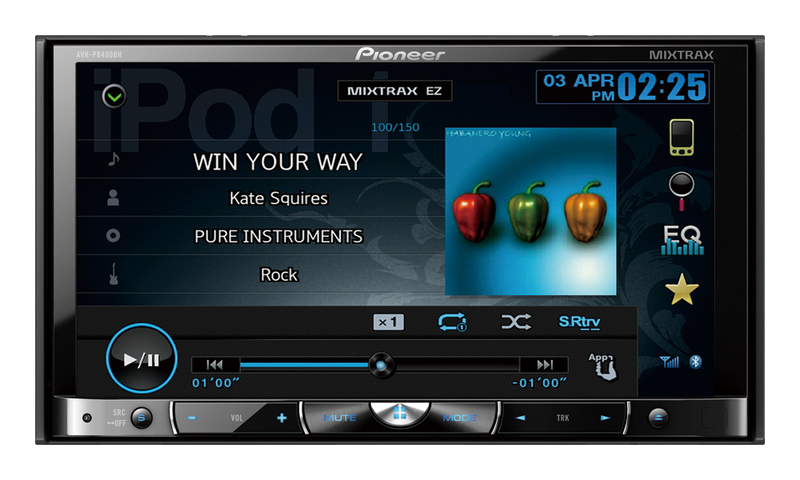 Pioneer’s in-car Audio Video receiver takes advantage of its large LCD touchscreen by animating the album art of the currently playing track in time with the mix, creating a truly unique in-vehicle music experience. To easily and quickly enjoy nonstop mix of music, a simpler version of the technology called MIXTRAX EZ is built-in to several Pioneer in-dash products for both in-car CD receivers and in-car Audio Video receivers. Featured in new in-car CD receivers (see model chart below), three types of DJ-style transitions (Flanger, Echo and Crossfade) and six sound effects (Backspin 1 and 2, Echo, Trans, Roll and Scratch) are automatically added between songs for a nonstop, continuous listening experience. To further enhance the “dance club in your car” atmosphere, the illumination buttons and display of the in-car CD receivers pulsates and changes color. Two modes of illumination (defeatable), each with six color patterns, create different light effects to give users a cool and fun experience. The third in-vehicle implementation of MIXTRAX is in an iPhone App that can be used with Pioneer’s revolutionary AppRadio™, the first in-vehicle product designed to utilize the smartphone’s processing power, storage capacity, network connectivity and apps as the primary source for its information and entertainment capabilities. Similar to the MIXTRAX software, the MIXTRAX iPhone App compares the tracks stored in the iPhone’s music library with Pioneer’s list of analyzed music stored in its Internet servers to identify musical characteristics and create custom playlists with DJ style effects and transitions for a nonstop mix of songs that can be played back and controlled through the Pioneer AppRadio.